Reimplemented in AMRNodeOp, AMRPoissonOp, ResistivityOp, VCAMRPoissonOp, ViscousTensorOp, EBAMRPoissonOp, EBConductivityOp, and EBViscousTensorOp. 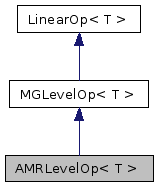 Implemented in AMRNodeOp, AMRPoissonOp, ResistivityOp, VCAMRPoissonOp, ViscousTensorOp, EBAMRPoissonOp, EBConductivityOp, and EBViscousTensorOp. Referenced by AMRLevelOp< LevelData< NodeFArrayBox > >::AMRProlongS().